The Ports-to-Plains Corridor is a transportation infrastructure project, but at its heart it is an economic development project. Transportation infrastructure is critical to economic development and we work hard to secure investment in the critical highways that provide connectivity that is essential for business to thrive in our rural region. We have been successful as evidenced by the more than a billion dollars invested in highway projects on the corridor. But it is up to our members to capitalize on these investments and attract new jobs in their communities. And our members are certainly doing that too. In this newsletter you can read about how two of our members, the Lubbock Economic Development Alliance and the Town of Limon were recognized for such successes. And of course economic development is always a key focus for our Annual Conference. This year the conference will be September 13 – 15 and our co-hosts, the City of San Angelo and the City of San Angelo Development Corporation are working hard to make this the best conference ever. You definitely do not want to miss it. 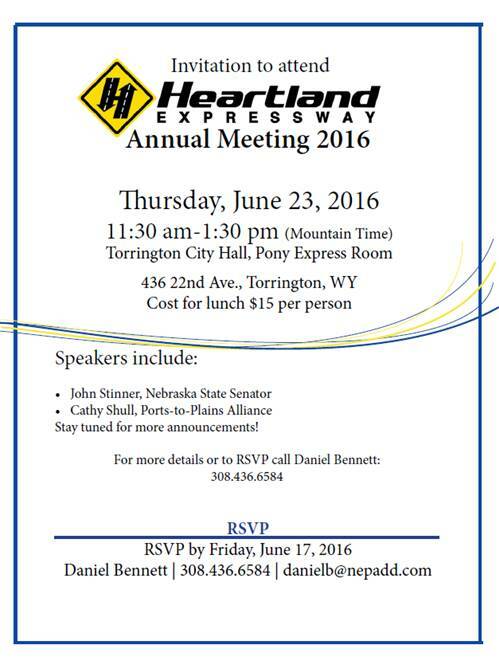 The Heartland Expressway Association will hold its 2016 Annual meeting in Torrington, WY on June 23, 2016 from 11:30 am-1:30 pm (Mountain Time) at Torrington City Hall, Pony Express Room. Speakers will include Cathy Shull, representing the Ports-to-Plains Alliance. Cost, including lunch is $15. Please RSVP by Friday, June 17, 2016 to Daniel Bennett | 308.436.6584 | danielb@nepadd.com. The Texas Economic Development Council presented the Lubbock Economic Development Alliance with a Workforce Excellence Award during a special awards breakfast Thursday morning. The award was presented to the LEDA team at the TEDC’s Mid-Year Conference in Irving. The LEDA Team was recognized for its efforts with the South Plains High Demand Training Project, the SEMI High Tech University with X-Fab Texas and the partnership establishing the South Plains College Career and Technical Education Center. Cotton producers will receive $300 million in one-time ginning-assistance payments to help cope with the global downturn in prices for the commodity. “The Cotton Ginning Cost Share program will offer meaningful, timely and targeted assistance to cotton growers to help with their anticipated ginning costs and to facilitate marketing,” said Agriculture Secretary Tom Vilsack. The payments will be based on a producer's 2015 cotton acreage, multiplied by 40 percent of the average regional ginning cost. Vilsack said the average payment would be about 60 percent higher than producers received in a one-year cotton transition payment under the 2014 farm bill. The Farm Service Agency already has data for the vast majority of producers. Cotton producers have been pushing for a longer-term form of assistance by making cottonseed eligible for payments under the Price Loss Coverage program, but Vilsack has said he doesn't have the legal authority to do so. The Town of Limon, CO continues to see significant increases in vehicle and truck counts from both the Ports-to-Plains Alliance Corridor and Interstate 70. The Town was pleased to be selected in this national competition to create a design vision to bring more of those travelers off the highway interchanges and into the main portion of Town. On June 1, the Citizens' Institute on Rural DesignTM (CIRD) announced that Limon, Colo. was added to the roster as a 2016-2017 host community, and was awarded a stipend from the National Endowment for the Arts (NEA) to host a rural design workshop in spring of 2017. When this opportunity was initially announced, the Town of Limon Comprehensive Plan update was in draft stage with many goals already outlined, in which the plan and goals have now been finalized. Expand in-town recreational facilities including parks, trails and indoor recreation. Improve gateway signage at both interstate interchanges. Establish a wayfaring system, including: streetscaping, pedestrian walkways / pathways, consistent lighting, banners, directional signage and other visual clues to direct and entice more people to downtown Limon, historic sites, parks, recreation facilities, open space and cultural resources. According to a recent Growth Summit 75 percent of participants supported continuity and visual clues leading to downtown and 67 percent favored expansion of the trail system. As a result of those goals, strategies and support, the Town of Limon began the application process. The support offered by the CIRD program would result in a stronger plan than local expertise could provide at a minimal cost to the Town. The completion of the Wayfaring Design Vision (WDV), including Alternative Transportation Options Vision, would strengthen future grant applications to implement the ideas.